Lots of cultivars to choose from in this section of ‘Cut Leaf Maples’ . A wonderful green variety of Acer Palmatum Dissectum is available as well as a crimson foliaged cultivar. It is the finely dissected foliage that gives a ‘lacy’ effect that makes these maples so popular as ornamental trees. 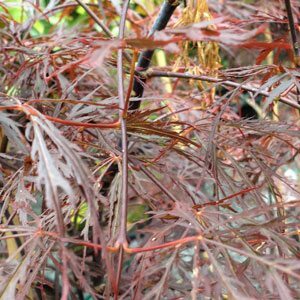 A. Palmatum Dissectum species include one ‘upright’ green cutleaf maple which is Acer Palmatum Dissectum Seiryu, a red cultivar that is also upright and a wide range of weeping cutleaf maples. Advanced and container grown plants are available from selected wholesalers. Also known as the the Fillagree Maples, deeply dissected foliage that gives a fine lacy appearance. Although many have a weeping habit, not all do. A. palmatum disectum ‘Sieryu’ being a notable exception, an upright dissected maple. Landscaping uses are mainly as stand alone feature trees, the larger types suited to planting in lawns or the garden border. The lower growing types are well suited to rock gardens, as well as for the general garden border and growing in containers. Planting Although weeping maples are said to be best in part shade, they coin fact perform better when not crowded. The foliage colour will also be better in autumn in colder climates. A good humus rich soil and a well drained position are best. Pruning Like most maples these lovely ornamental trees require no regular pruning, only remedial pruning to remove dead or damaged wood. Fertilizer In good soil, once established maples need very little fertiliser. An application of a general purpose, slow release fertiliser in spring and late summer can assist with growth.